Here is a great example showing correct placement of your OL8 Onion Lanterns. This is an important factor when installing a doorway lantern. 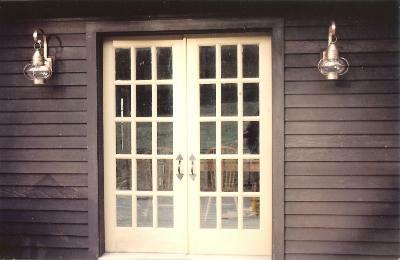 Here the onion lanterns sit at a height even with the finish trim around the doorway and not too close to the door. Thus it creates an overall appealing aesthetic look. Hammerworks reproduction Colonial Onion Wall Lanterns are handmade in a practical and functional choice for any setting. We handcraft these versatile historic reproduction Wall lanterns from solid copper or solid brass. Furthermore they coordinate with our Post mount and Hanging Onion Lights. Since we make our Onion Wall Lanterns in several sizes you are sure to find one just right for your space. Hence they can be used in a variety of indoor & outdoor settings. Other than the obvious placement on your home’s exterior, interior uses can range from entrance halls & kitchens to family rooms, bedrooms& bathrooms. Onion lanterns can be used wherever a light is needed, and the attractive design blends well with a multitude of decorative styles. First and foremost Hammerworks creates Onion Post Lanterns completely by hand. Furthermore we make each Colonial Onion Lantern out of your choice of solid copper or brass. Consequently they can withstand harsh weather conditions and will not rust or corrode. In addition we offer Onion Post Lanterns in three different sizes as well as with either a round or onion shaped glass globe. Finally, our Early American Onion Post Lights coordinate perfectly with our Wall mount and Hanging styles. 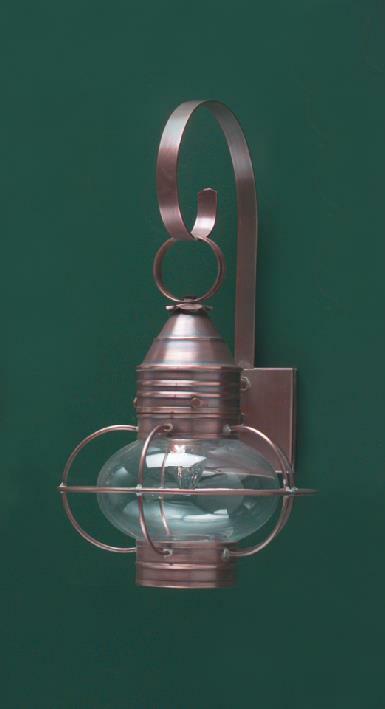 Hammerworks offers a collection of handcrafted Colonial Onion Wall Lights in a range of styles and sizes. As a result you can easily coordinate your lighting scheme. Onion Lanterns evoke a quintessential nautical design defining old New England craftsmanship. Originally used as work lights on fishing vessels, these solid copper or brass lights are suitable for many home styles. While they are popular for Cape Cod Style Homes, Copper Onion Wall Lights are ideal for Early American Colonial, Traditional Styles and Lakeside Homes among others. Most importantly we include post mount, wall mount and hanging Onion Lanterns in our collection. Thus we are a complete source when choosing Onion Lanterns for your home..